A few weeks ago, I was walking with my kids when I spotted a neighborhood friend who’d recently had a baby. I stopped for a little chat and noticed that I didn’t recognize her stroller’s brand. Her stroller’s design intrigued me, so I asked her what it was — it was a Cybex stroller. Having had a few kids myself, I now have a weird obsession with strollers. It’s not something I expected until I became a mom. Suddenly I realized they were everywhere! And they were pretty nice too. Cybex is an interesting brand. Firstly, the company is European – from Germany specifically. Their focus is designing strollers for the busy parent and their urban lifestyle. They are a luxury brand who also do limited edition designs in addition to their main range. Some of these designs are in collaboration with famous designers. For example, recently Jeremy Scott put his spin on the Cybex Priam range, which is part of the company’s platinum series. It is nothing like you’ve seen before. Designed for city environments, this stroller is lightweight and agile. I found it easier for me to focus on my beautiful surroundings while walking, something I do less of when a stroller is hard to navigate. The Cybex Agis M-Air3 (rolls off the tongue doesn’t it? lol) is compact and fun to use. This will work from a newborn to about 55 pounds, so basically the whole time they’ll need it. The compact size of this stroller is perfect for running to and from daycare or even while traveling. A few of my friends use this as their second stroller, for those times when they need something less bulky and nimble. It’s lightweight, so using a stroller is less of a strenuous activity. If like me you live in a hilly area, you will appreciate it’s lightweight design. And if you own a small car, this takes up very little space. In terms of the finish, the stroller looks high end as you would expect from Cybex. The fabric is good quality and the brand’s logo looks chic and not in your face like you find in most strollers. One big reason I like this stroller, is that it can be converted into a travel system. If you don’t know what that is, it means you can snap on a car seat or carrycot onto the stroller’s frame. You can only use one type of seat at a time, but it’s really convenient if your baby is sleeping and you don’t want to a) carry the car seat around by hand or b) transfer your sleeping baby to the stroller. The car seat locks onto the stroller frame so the baby won’t even know what happened. Similar to the Agis M-Air3 stroller, this stroller is lightweight and easy to maneuver. One of the main differences, however, is that it has four wheels instead of three. For some people, they prefer the classic four-wheel stroller design, so this is perfect for them. If the Agis-M Air3 sounds too compact, then you might prefer this stroller. While it is still pretty compact, it edges out the Agis-M Air 3 in size. The four-wheel design means you get a little more control over rough terrain or an unexpectedly bumpy sidewalk. Although this stroller is a little bigger than the Air 3 stroller, it only weighs one pound more. Not a huge leap in terms of weight, which I appreciate. One thing I love about modern strollers is that you can switch out the toddler seat for a car seat or even a carrycot. They call this a “travel system” and it is very convenient if you find yourself lugging your car seat around with you. Rather than strain yourself, just snap your car seat onto this stroller frame and let it do the work for you. No one needs to be carrying a car seat in 2018. With this travel system, you kill two birds with one stone. 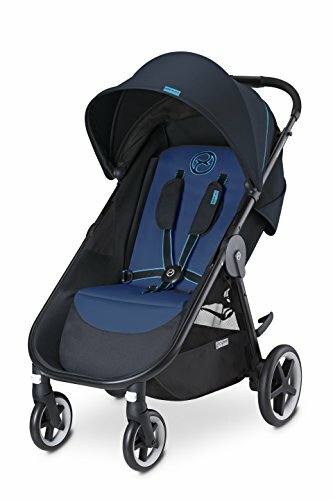 You get a stylish lightweight stroller and also their highly-rated car seat, the Aton 2. The best part is that you can easily swap out the stroller’s seat and replace it with the car seat for extra convenience. 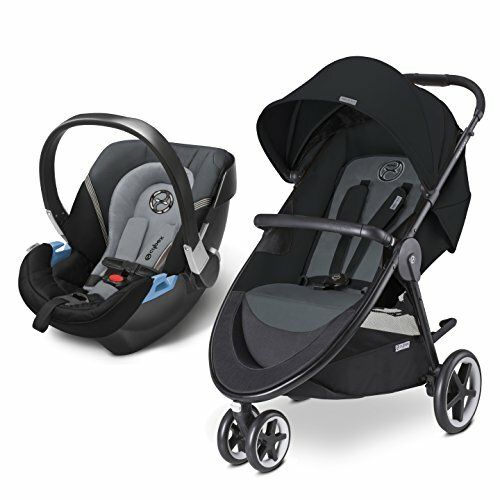 As a set, the stroller and car seat are perfect if you want something lightweight and compact. Some car seats are absolutely massive, but the Aton 2 from Cybex is ideal for smaller cars. Despite its compact design, you are not getting less protection for your baby. Due to strict regulations, car seats are put through rigorous safety checks before being put on the market for public sale. 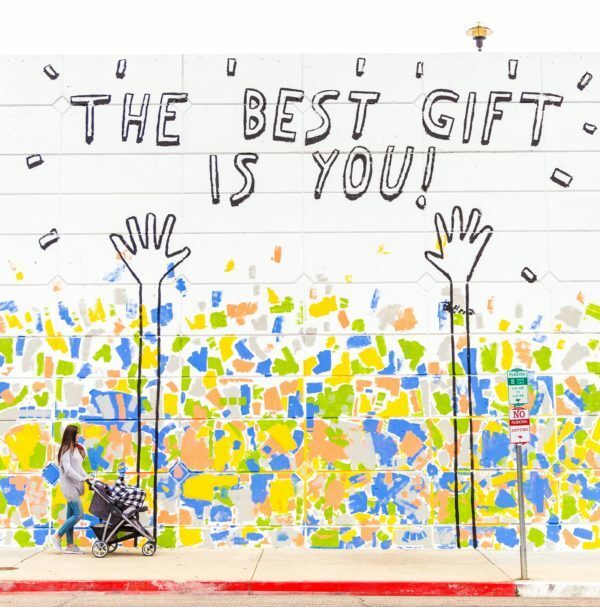 Not to mention Cybex has over 25 years of knowledge and research into design, testing and child safety, due to merging with Goodbaby International Holdings Limited in 2014. Not too long ago, using a car seat was a complicated process. Somehow, securing it to your car’s backseat took 30 minutes (if you were lucky). Factor in trying to get to an important appointment and the whole thing became a race against time. Luckily with this Cybex car seat, installing the car seat is really hard to mess up. Making sure your baby is safe before getting on the road is a cinch with this car seat. And when it comes time to remove the car seat, it releases easily from the car seat thanks to a handy release switch. The car seat feels secure and has a strong side-impact design. Because of the lightweight design, I was able to carry the car seat easily without feeling like I’d lifted 50 lb. weights. And because it’s not bulky, it is able to fit in my little car without feeling squeezed in. 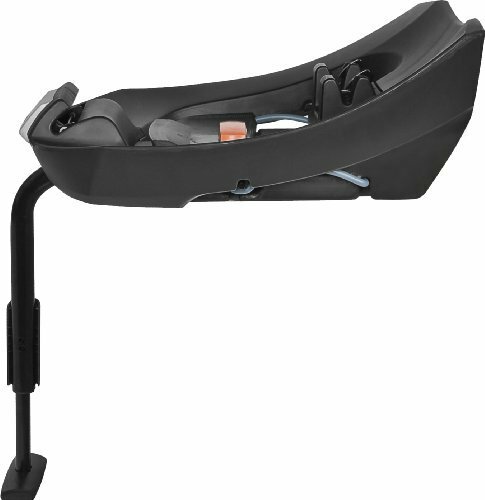 The first thing to mention about the Cybex Pallas M-fix, is the forward-facing design. To account for this sitting position, there is a cushion that rests against your child’s lap. This in effect acts like an airbag and a harness all at once. The impact cushion (ie. airbag), is designed to spread the impact of a collision. It took my mind a while to wrap around the concept, but it feels very secure. It’s really down to your own preference as a parent, so just keep that in mind. As you would expect for a car seat that is designed for children 9 months to 12 years old, the car seat is big. To be honest, it’s not bigger than most car seats, so it’s not that different in terms of what’s already available. Since you may be using this car seat for years to come, the cover is made of durable material that is also washable. I like that it is long-wearing, which I think is very environmentally friendly. All in all, this car seat is an interesting choice for sure. 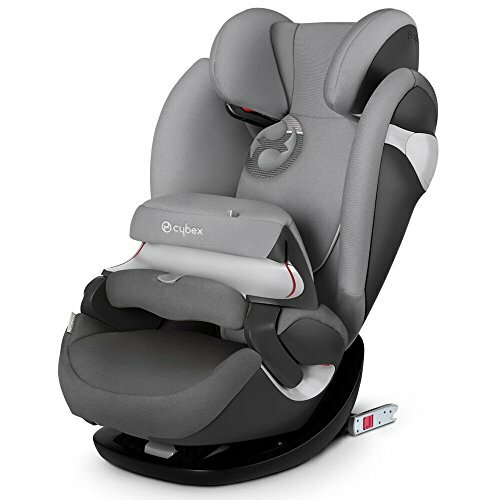 Part of their platinum series, the Cybex Aton Q car seat is a combination of style and safety. Take a look at the profile of this car seat and you’ll know what I mean by its stylish design. It is futuristic, but not gimmicky. If you’ve never thought a car seat could be beautiful, think again. To show off this gorgeous car seat, I recommend using it with the Cybex Priam strollers. 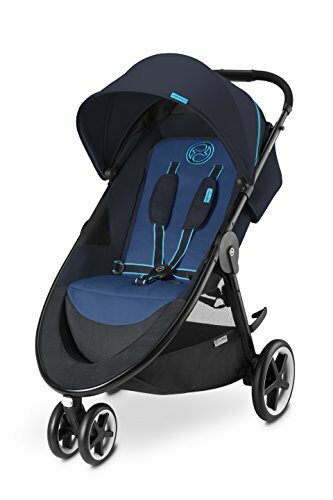 It is compatible with the Callisto, Topaz, and Onyx strollers as well as a few other non-Cybex strollers such as Bugaboo and Baby Jogger. 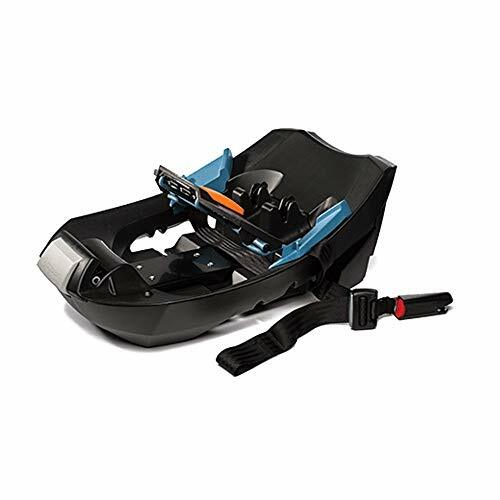 Compatible with both the Aton Q and Aton 2 car seats, this car seat base from Cybex, gives you added safety and convenience. You just drop your car seat onto the base and wait for the click. The indicator turns green to let you know you’ve done it correctly, taking the guesswork out of using the base. You could use your car seat on its own, but honestly, just try it with the base. It is so much quicker and sweat-free. In the summer, I just want to secure my baby and start my journey as soon as I can. A lovely addition to the Cybex brand, the Cybex2 Go baby carrier is comfortable for you and your baby. There are five different carrying positions, so you have many options to make the carrier work for you. To accommodate different babies, the width of the seat area can be adjusted. Believe it or not, even my tall husband found this carrier comfortable. It can definitely accommodate a range of heights, which is quite useful when you are sharing the baby carrier. For something a little different and long-lasting, Cybex is the luxury stroller brand worth looking into. Their safe strollers and car seats make sure that your little one is kept secure and comfortable. The interesting designs makes using such practical items fun and also graceful. 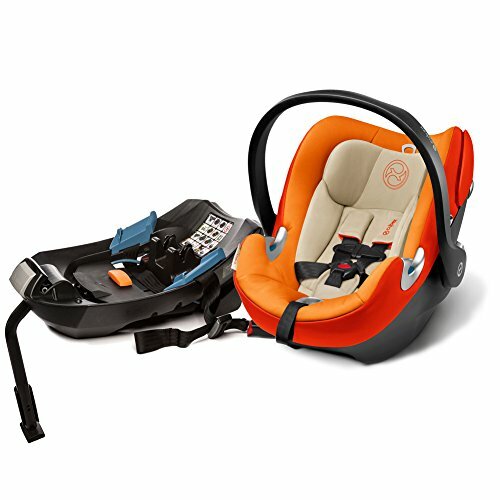 Have you tried Cybex strollers or car seats before? 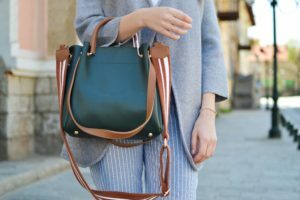 Or do you use another luxury brand? Do tell.